When a swimming pool becomes damaged, there are two options for fixing it. A homeowner can call a professional and have them fix it, or they may decide to take this on as a do it yourself project. Depending on the severity of the problem will depend on the final cost of the fix. 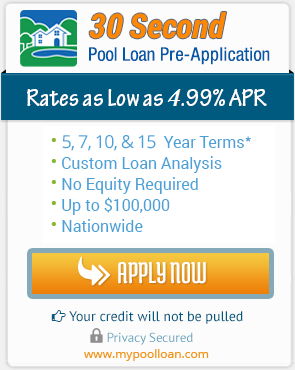 If major issues should arise with the pool in your backyard, then it may be time to consider taking out a swimming pool repair loan. Fixing a swimming pool can add up quite quickly, as these fixes are usually pretty expensive in themselves. This will allow the homeowner to fix the swimming pool correctly, and still be able to enjoy the pool as the individual and their family once did before the repair needed to be made. A word to the wise though, if one does not have any luck with repairs, or are not inclined with pool lingo, it may be best to contact a professional. A professional can guarantee that the job is done in a safe manner and correctly to ensure that the problem does not grow out of hand. If one has a vinyl pool, and a hole pops up in it, there are vinyl patch kits that can be purchased. These kits are relatively inexpensive, and can be used both above water and underwater. It is simple to cut the material to be 1/2 larger than the hole in the vinyl in an oval or circular shape, then quickly clean the pool where it is to be patched. Next apply the vinyl glue around the hole, and apply the patch. If the patch needs to be placed under the water, apply the glue straight to the patch, then fold over on top of itself. Then wait 3 minutes, press the patch onto the hole, rubbing all air from the patch. Wait a good 10 to 15 minutes, then rub over the patch again to make sure all air bubbles are out and the patch has successfully stuck. Now if the hole in the vinyl is rather large, it could be impossible to repair. The only option may be to purchase a new vinyl liner. A pool that is made of concrete may become cracked. Cracks in pools happen when there are extremely cold winter weather. A crack that is small in nature can be patched quite easily, however if the crack is large, it may require the the entire pool be fixed. In this case, it would be best to consider having a professional take a look. Keep in mind that a small crack can lead to a larger crack and further damage the pool, so it is often best to have it looked at as soon as the crack is discovered. Fiberglass pools are designed to be strong and durable, and most homeowners do not have an issue with repairing them too often. However, they have a tendency to become an eye sore when they discolor, and the only way to fix this would be to do an acid wash on the pool. This undertaking is best described as stripping off a layer plaster to expose a new, fresh layer. An acid wash will give a fresh, clean appearance to the pool. However, since the acid wash deals with acid, it is best to have someone who is professionally trained do this to ensure everyone’s safety. Other parts of your pool may need to be repaired as well. Sometimes issues arise with the filter or the pump. There are many aspects to a pool that could need fixed. Maybe the heater is not working correctly or there are tiles in the pool that are chipped or cracking. Or possibly the pool cover needs to be repaired. There may be issues with the chlorine generator. In this case, it is best to call a pro that will be able to pinpoint the problem and fix it correctly. These are all issues that can become quite costly, but making payments on them will allow the pool to be fixed correctly so everyone in the family can enjoy the pool as they once did without any issues. And fixing issues with the pool will make it last longer. Having the issue fixed now will ensure that in the future, all things run smoothly as they should.